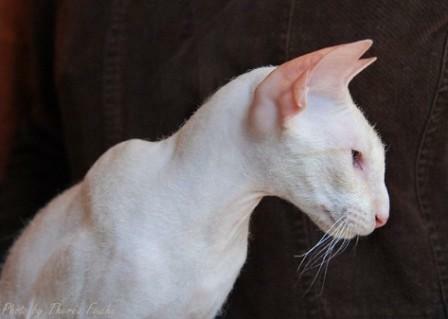 The Peterbald was created in 1993 by a Russian cat breeder, Olga Mironova from St Petersburg. Ms Mironova crossed an elegant female tortoiseshell Oriental Shorthair cat named Radma von Jagerhof to a handsome Don Sphynx cat called Afinogen Myth. This union produced 4 kittens which were to become the foundation cats of this new cat breed. 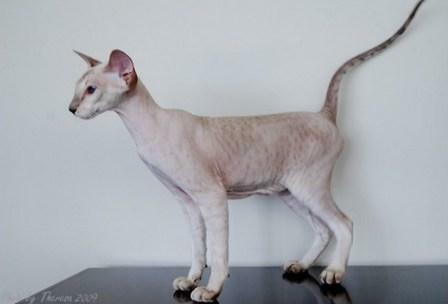 The first Peterbald imported into the USA from Russia was a direct descendant of one of these kittens and established the breed in the United States. The overall look of this hairless cat is described as a graceful and elegant cat with a long body, long legs and long neck - a svelte and sturdy-looking cat with firm well developed muscles and a fine bone structure. Its legs are long and slender, the back legs are slightly longer than the front legs and the paws are oval in shape with prominent toes and webbing between the toes. The tail is well balanced with the body length and is long, strong and whippy. The head is wedge-shaped (or inverted triangle shape), with a flat forehead and high cheek bones. The muzzle is straight and strong and blunt and the chin is strong and should not protrude. Its eyes are medium sized and described as almond or Oriental in shape and set at a slant. Any eye color is accepted and there is no association between eye color and skin/coat color. The cat's ears are large and pointed, wide at the base and slightly flared. From far the coat looks completely hairless, but on closer examination, there is hair of about 1 mm long. 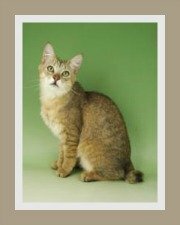 A mature Velour cat's coat can sometimes change to a Chamois or Flock coat. This coat type is about 90 % hairless and the skin feels smooth and there is no stickiness. No hair is visible. The extremites may present with down and the eyebrows and whiskers may be broken, kinked or curled. In this instance, the cat is completely bald. It is born bald and never grows any hair. The cat has no eyebrows or whiskers. The skin feels warm and soft and is slightly sticky. Basically, these cats do not carry the hairless gene. They have 'normal' short, sleek coats that lie close to the body and they have 'normal' eyebrows and whiskers. The coat hair is about 5 mm long and can be curly or wavy and the whiskers are also kinked or curly. 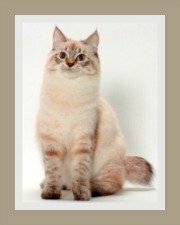 In some cases, a kitten that has a thin brush coat can become completely bald at around 2 years. A kitten born with a heavy brush coat will keep its dense brush coat for life. Peterbalds are indoor cats. They are prone to extreme heat and cold and it is preferable to keep them indoors. To prevent boredom, create an indoor adventure zone for your companion. It should include cat gyms, toys, scratching towers and if possible an indoor garden full of non-toxic plants. 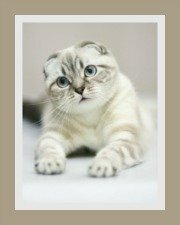 They get on well with other cats and dogs and make ideal pets for children. Children need to be reminded that cats do not tolerate rough play or tail and ear pulling! Some people say it has inherited its temperament from both the Oriental and Don Sphynx. 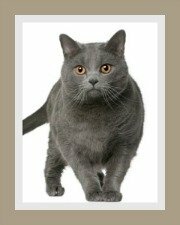 It is a lively, sociable and gregarious cat and loves lots of attention. This little darling does not enjoy solitude. 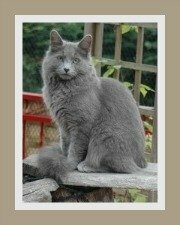 This cat has a wonderful even temperament and is affectionate, gentle and loyal and adores its owner. Is is a highly intelligent cat that is easy to train and responds to voice commands. They can be quite vocal and loud. 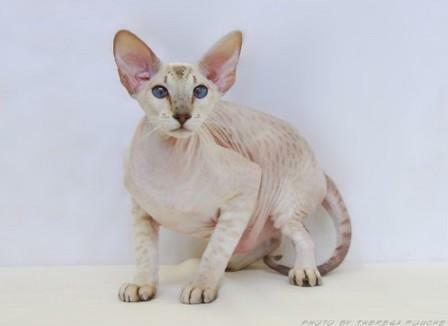 Whilst it is a hairless cat (or has minimal hair), it is not a low maintenance cat breed! Its skin, like human skin, sweats and as result daily sponging is recommended. A monthly bath is suggested. Nail clipping every 4- 6 weeks and weekly dental hygiene is also needed. We have prepared an in depth guide to hairless cat care which will assist you in caring for your cat. This is a healthy cat. It goes without saying that due to the lack of hair its skin needs special care. Protect the skin from sunburn and extreme cold and drafts. They may be prone to gum disease and tooth decay so regular dental check-ups are advised. They are not hypoallergenic cats. Allergic reactions to cats are caused by the protein Fel D1 found in the saliva, hair and dander, which is the old skin that cats shed. This cat needs a well balanced diet and the best cat food you can afford. 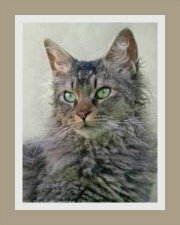 There are special commercial diets for hairless cats which you may want to consider. It is also advisable that this cat's calorie intake increases in winter to keep its body temperature above normal. This is a new cat breed and still too early to establish the average life span. 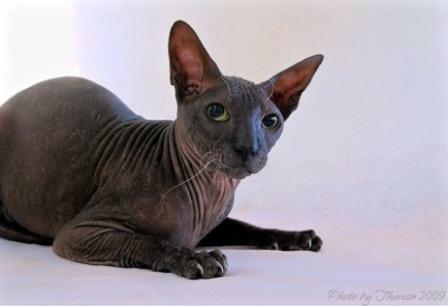 Being a cross between the Oriental and Don Sphynx, we can safely assume that a well cared for cat will have a life expectancy of about 12 - 15 years.